Verizon Wireless and AT&T are in an ad war right now. First, Verizon came out with their “There’s a map for that” ad promoting their cell coverage while insulting AT&T’s. Then AT&T sued Verizon and lost. After that, AT&T fought back by hiring actor Luke Wilson to sling mud about Verizon's network - and back and forth they go. 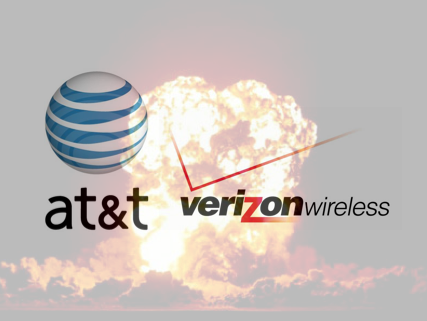 At the end of all this, the net result will be that both AT&T and Verizon will have spent hundreds of millions of dollars and the negatives towards each company will be heightened, causing consumers to like each company less. My bet is little to no market share will actually shift as a result of this. The easy reaction to this is to sigh and mutter, "What a waste!" While this would certainly be a very reasonable response, there is an instructive lesson and huge warning sign for growth oriented companies. When companies fail to consistently create value - and by extension create demand, competitive pressures become increasingly intense. The challenge that both AT&T and Verizon Wireless have is that neither of them does anything particularly special. While Apple, Google, Palm and other handset makers continue to innovate and search for new ways to delight customers, AT&T and Verizon Wireless are left fighting over who's 3G network is better. I wrote about this six years ago: "We are better" value propositions don't work. This entire ad war reminds me of political campaign and negative campaigning. When you play the competitive game I call Demand Fulfillment, you are increasingly vulnerable to competitive attacks and mudslinging. The solutions focus of demand fulfillment makes compelling differentiation virtually impossible. Features and benefits become commodities. Developing new applications become increasingly expensive and risky. Because margins are tight, companies desperately search for quick hit tactics that can "have an impact." What's the quickest, easiest tactic? Insult the competition. Sure, we all know that we're not supposed to say bad things about the competition (that's what I was taught in sales training), but politicians proved years ago that scaring buyers voters about their opponent had far more immediate impact than building themselves up. Of course, if the company being insulted is vulnerable to competition, they must fight back, and before you know it millions (or for small businesses - thousands) of dollars are wasted on inane messages, rather than on developing deeper understanding and connections with core customers. Companies that create demand are increasingly immune from competitive pressures. Their maniacal focus on their customers - and solving their customers problems - give them a competitive-free like status. So long as they continue to build deeper relationships with their customers and desired markets, attacks from competitors have no impact. The lesson for every company, even especially those companies in difficult markets, is to stop playing the traditional game. If you do, the AT&T - Verizon Wireless war is your future. Start creating demand. Determine the results your customers want, help them understand the problems they don't understand that are preventing them from getting those results, and sell a new solution. Don't tell me people won't pay more or do different things in this market, because I know that will. It's your choice! So, what are you going to do differently to create demand?